In today's post, we will study one of the earliest developments in smokeless powder technology: the invention of gun cotton. 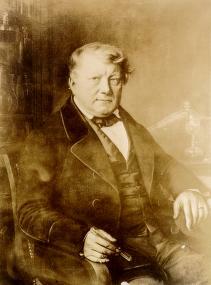 Christian Schönbein. Public domain image. Schönbein was a professor of chemistry at the University of Basel in Switzerland. His wife laid down an order to not conduct any chemical experiments at home, but he didn't always obey her and would do his experiments at home when she was not around. One day in 1845, his wife went out for some time and he went into the kitchen and mixed up a combination of nitric acid and sulfuric acid. Due to careless handling, he spilled the mixture onto the kitchen table. He quickly grabbed his wife's cotton apron and wiped the mess up and then hung her apron over the stove to dry, so she would not find out that he'd been doing experiments at home when she was away. To his surprise, the apron suddenly ignited and burned very rapidly, leaving almost no ash behind. What he had done was accidentally create nitrocellulose (gun cotton). The cellulose combines with the nitric acid forming nitrocellulose and water (H2O). It would appear from this above equation that only nitric acid is needed for this reaction. However, note that one of the other byproducts of this reaction is water, which would end up diluting the remaining nitric acid and cause it to form other nitro-compounds instead. This is where the sulfuric acid comes in. The sulfuric acid takes care of the water formed by this reaction and also acts as a catalyst to form the NO2 ions. In the original version of his process, Schönbein mixed three parts of sulfuric acid to one part of nitric acid by weight. Then, he would take twenty to thirty parts of this acid mixture into a porcelain vessel and dip one part of cotton at a temperature of around 10° to 15° C for an hour. After that, the liquid was poured out and the gun cotton was thoroughly washed in water and then in a dilute potash solution to eliminate acids. It was then again washed in water to dissolve any salts formed from the previous washing, then squeezed out to remove the water, then soaked in 0.6% solution of saltpeter, squeezed out again and finally dried at 65° C. Later on, Schönbein modified this process to use 14 parts of a mixture of equal volumes of nitric and sulfuric acids, to each part of cotton. Gun cotton produces about six times the amount of gas than the same volume of black powder, while producing far less smoke and heat. Now that we've studied the reaction at a high level, we will look at some of the machinery used for this process in the next few posts.